Playoff experience matters in our 2017-18 NBA projections — and they have plenty of it. Stop me if you’ve heard this one before: The Golden State Warriors and the Cleveland Cavaliers are favorites to win their respective conferences and reach the NBA Finals. That’s according to FiveThirtyEight’s “CARM-Elo” projections, which we’ve just launched for the 2017-18 NBA season. The Warriors and Cavs project to be the best regular-season teams in their respective conferences, although the Houston Rockets and the Oklahoma City Thunder — and perhaps the San Antonio Spurs — could represent formidable rivals for the Warriors in the West. Cleveland has less competition in the East. (Our projections are bearish on the Boston Celtics.) But Cleveland and Golden State could have an even larger advantage in the postseason. Apart from one new wrinkle, our methodology for making these projections is essentially the same as it has been for the past two seasons. So I’ll spend the bulk of time here discussing what has changed. The new wrinkle: Our forecasts account for the amount of playoff experience on each team’s roster. Throughout NBA history, teams with extensive playoff experience have often found a higher “gear” in the playoffs. Put more precisely, they have a tendency to win more playoff games than you’d expect from their regular-season performance. This group of teams includes the Cavs, a team that our forecasts have often underrated once the playoffs began — and that won 12 of its first 13 playoff games last year after a mediocre regular season. Indeed, it’s extremely rare for teams without at least an average amount of playoff experience to win the NBA title. We calculate a team’s playoff experience by averaging the number1 of career playoff minutes played2 for each player on its roster, weighted by the number of minutes the player played for the team in the regular season.3 (Teams don’t get any credit for signing a playoff-experienced veteran if they never play him.) For instance, last season’s NBA champions, the Warriors, entered the playoffs with a weighted average of 1,966 career playoff minutes, which ranked third in the league after Cleveland and San Antonio. By contrast, the Portland Trail Blazers — the Warriors’ first-round opponents — averaged just 493 minutes of playoff experience. Each of the past 36 NBA champions have ranked in the top half of their respective leagues in playoff experience. So have 62 out of the past 66 champions; the lone exceptions were the 1980-81 and 1956-57 Boston Celtics, the 1976-77 Portland Trail Blazers and the 1955-56 Philadelphia Warriors. * Average number of career playoff minutes, weighted by each player’s share of regular season minutes played. You might be wondering if we’re confusing cause and effect. For instance, Michael Jordan and the 1990s Chicago Bulls were really great; as a result of being great, they made deep playoff runs every year and won six NBA titles, accumulating lots of playoff experience along the way. Playoff success causes playoff experience and not the other way around, you might say. We’ve found, however, that there’s predictive power in accounting for playoff experience above and beyond other measures of team quality. In particular, playoff experience provides information beyond a team’s Elo rating, which accounts for its record, strength of schedule, and margin of victory or defeat in recent games. In the NBA postseason since 1980, the team with the higher initial Elo rating has won 74 percent of playoff series. But if a team has both a higher Elo rating and much more playoff experience,4 that win percentage shoots up to 86 percent. Conversely, teams with the higher Elo rating but much less playoff experience have won just 52 percent of playoff series. These differences are highly statistically and practically significant. Based on past research on the topic, we were expecting to see teams reap some benefit from playoff experience, but we were surprised that the effect was this strong. What we’re less sure of is why this effect exists. Playoff basketball is a different beast than regular-season basketball, with much tighter defensive play, among other stylistic changes. It may simply be that nothing predicts playoff success quite like past playoff success. Or it may be that some players really are “clutch” — or can learn to be clutch with experience — and have the psychological skills to thrive under postseason pressure. It’s also possible that teams like LeBron James’s Cavs aren’t overachieving in the playoffs so much as they’re underachieving — or pacing themselves — in the regular season. The NBA season is exhausting, so it’s probably a good idea to pace yourself if your goal is to maximize your chance of a deep playoff run rather than to accumulate gaudy regular-season statistics. All we know for sure is that playoff basketball is different from regular-season basketball — different enough that it makes sense to maintain what amounts to two sets of ratings for each team, one for the playoffs and one for the regular season. And that’s essentially what our new system does: It keeps two sets of ratings. Below, you’ll find each team’s projected margin of victory or defeat against a league-average opponent in the regular season and the playoffs, respectively.5 Note that the most experienced teams, like the Cavaliers, project to be 2 or even 3 points better per game in the playoffs than in the regular season, which is similar to the magnitude of home-court advantage in the NBA. So when an experienced team plays an inexperienced team in the playoffs, it has the equivalent of home-court advantage — more experienced teams don’t always win by any means, but the breaks tend to go their way. 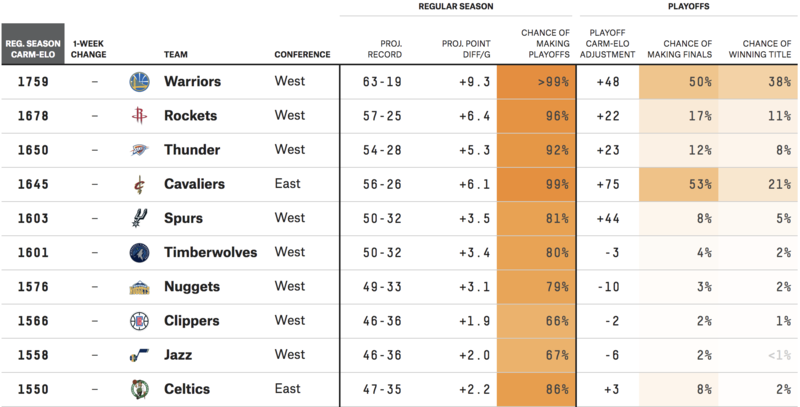 Overall, the Warriors — who have the second-most playoff experience after the Cavs — have a 38 percent chance of repeating as NBA champions, according to our projections. If you’re not sure whether that is low or high, consider that the New England Patriots had only an 18 percent chance of repeating as Super Bowl champions at the start of this year’s NFL season, according to our NFL Elo projections. 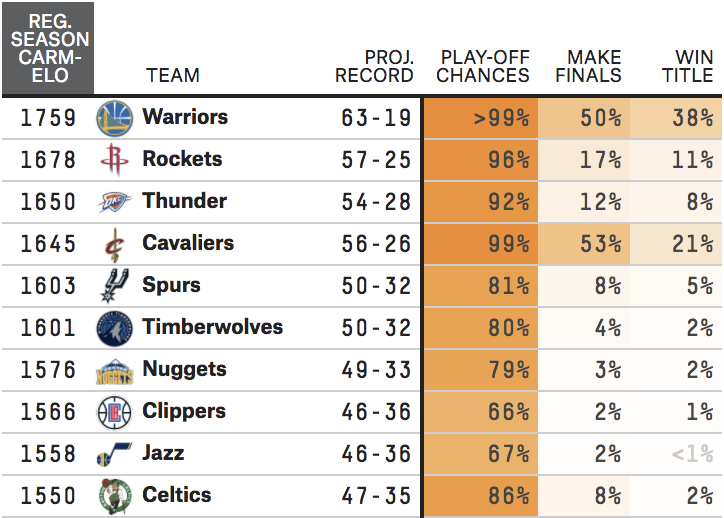 But 38 percent is somewhat lower than where Vegas odds have the Warriors, which imply more like a 45 percent or 50 percent chance that they’ll repeat.6 The competition is a bit deeper this year, and the Warriors are no longer a young team. Still, the playoff bonus helps them — without it, their chances would be 34 percent. After that, there’s a pretty big gap before you get to anyone else. Teams such as the Minnesota Timberwolves might not be that far behind teams like the Spurs and even the Cavs in the regular season. But because of their relative inexperience, they’re less likely to take advantage of their playoff opportunity and make a deep postseason run. Finally, just some general background on these projections. We call these “CARM-Elo” forecasts because they combine our CARMELO projections for individual players, which are used to set the initial ratings for each team, with our Elo-rating based method of simulating out the rest of the season. As part of this process, we’ve built depth charts for each team to estimate playing time over the course of the regular season. There is unavoidably some guesswork involved in creating the depth charts, which reflect a rough consensus of depth charts from RosterResource.com, ESPN.com and CBS Sports and account for injuries. However, CARMELO projects an expected amount of playing time for each player, and when building our depth charts, we usually stick fairly closely to this recommendation for a team’s rotation players. In fact, our model punishes players who are “forced” to play substantially more than their CARMELO-forecasted playing time by lowering their efficiency rating. For example, Doug McDermott of the New York Knicks is projected to play 20 minutes per game in our depth charts when CARMELO recommends that he only plays 15 minutes per game, so our forecast assumes that he’ll become somewhat less efficient as a result. Our CARMELO projections themselves underwent some changes earlier this year, which you can read about here. In particular, we’ve switched back to a system that rates players based on a combination of Real Plus-Minus and Box Plus/Minus instead of solely using BPM, as we did last year. Both RPM and BPM have their weaknesses, though: Neither is especially accurate at accounting for defense; both can struggle with players with extremely high usage rates (say, Russell Westbrook or DeMar DeRozan); and they don’t take much advantage of the NBA’s new wealth of player-tracking data. If it sounds like I have strong opinions about this stuff, it’s because I do; we’re working on our own player-rating metric, which we hope to unveil in the relatively near future. In the meantime, good luck to the 28 NBA teams hoping to knock off the Warriors and the Cavs. It’s never easy, and it won’t be easy this year, especially once the playoffs come around. Only playoff games from previous seasons count toward the calculation; we don’t give a player credit for the experience he’s accumulating in the current season’s playoffs until the next season. Minutes played aren’t available before the 1951-52 NBA season; for the earlier seasons, we estimate the number of minutes played based on the number of playoff games played. For our 2017-18 projections, we use projected minutes based on our depth charts. A difference of at least 1,000 average lifetime playoff minutes played. These margins of victory differ slightly from the average projected point differential on the “CARM-Elo” interactive graphic because those “CARM-Elo” point differentials account for the strength of a team’s schedule, whereas my calculations for this article do not. The combined probability of the 30 NBA teams winning the NBA title is 132 percent, according to the odds listed at VegasInsider.com. Obviously, this can’t be right — the odds must add up to 100 percent exactly — but the inflated numbers reflect the house’s cut. The Warriors’ probability of repeating is 62 percent taken at face value but falls to 47 percent once you correct for this.